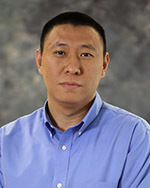 He Liu working as an Assistant Professor in Department of Biology, Gannon University. He completed his Postdoctoral research fellow in Center for Learning and Memory, University of Texas at Austin in 2011. He Liu earned his Ph.D., Zoology (Molecular Neurobiology) at the University of Texas at Austin, 2006. He is an eidtor and reviewer of many international research journals. 2. Liu H. and Aldrich R. 2011 Tissue-specific N-terminus of hyperpolarization-activated cyclic nucleotide-gated (HCN) 4 channel affects channel activation Journal of Biological Chemistry 286(16):14209-14. 3. Liu H., Wu MM, Zakon HH. 2008 A novel Na+ channel splice form contributes to the regulation of an androgen-dependent social signal. Journal of Neuroscience. 28(37):9173-82. 5. Caixia Guo, Tieshan Tang, Xiaoming Mu, Shuhong Li, Guoqiang Fu, He Liu and Yixun Liu1999 Cloning of novel temperature-related expressed sequence tags in rat testis during spermatogenesis Biochemical and Biophysical Research Communications (258), 401-406. 6. Liu H, Wu MM, Zakon HH 2005 Co-expression of an electric fish Nav1.4 homolog and two alternative pliced Na channel beta1 subunits in Xenopus oocytes Society for Neuroscience Annual Meeting, San Diego. 7. Liu H, Zakon HH 2005 Expression and hormonal modulation of sodium channel subunits in the electric organ of a weakly electric fish. Society for Behavioral Neuroendocrinology annual meeting, Austin. 8. Liu H, Zakon HH. 2004. Expression and alternative mRNA splicing of sodium channel subunits correlated with cellular excitability of electrocytes in a weakly electric fish. Society for Neuroscience Annual Meeting, Washington D.C.
9. Liu H, Zakon HH 2003 Aromatase expression in a weakly electric fish. Abstract and Poster Presentation, Society for Neuroscience Annual Meeting, New Orleans.